One of the most unique and distinctive monuments in the world, Mount Rushmore is located in the Black Hills of Keystone, South Dakota. The Mount Rushmore National Memorial can be found in the western part of the state, not far from the border with Wyoming. Mount Rushmore itself is actually a batholith, which is a large, protruding section of rock, with a sculpture of four of the most famous Presidents of the United States on its face. The Mount Rushmore National Memorial covers an area of 1,278 acres in total and attracts several million visitors per year, being an iconic landmark for American citizens and international visitors. The sculpted faces at Mount Rushmore depict four key figures in American history and politics: the first President of the United States, George Washington; the third president and the principal author of the Declaration of Independence, Thomas Jefferson; the 26th president, Theodore Roosevelt; and the 16th president, who led the nation through civil war and helped to abolish slavery, Abraham Lincoln. Each sculpture measures up at 60 feet (18 m) in height, and the idea came from Jonah 'Doane' Robinson, a South Dakota historian. Artist and sculptor Gutzon Borglum was given the task of designing and overseeing the construction of the sculptures. Robinson originally wanted to include various Old West figures and heroes, but Borglum settled on the idea of using presidents instead. Construction on the project began in 1927 and took many years to finish. The faces were gradually completed between 1934 and 1939, and the original idea was to continue down to their shoulders and chests, but a lack of funding and the death of Borglum in 1941 resulted in the project being terminated with simply the heads. The elevation of a monument, memorial, town, city, mountain, or other key location tells us how high or low it is in relation to sea level. Many locations are above sea level, but some can technically be classed as being below it. Elevation is measured in feet or meters and can have a variety of practical uses. The elevation of Mount Rushmore is 5,725 feet (1,745 m) above sea level. The elevation of the nearest city of Keystone is 4,331 feet (1,320 m). The average elevation of the United States is at 2,500 feet (760 m), so Mount Rushmore’s elevation is over twice as high as the national average. South Dakota is actually the 13th highest state of all in terms of its average elevation. The highest point in the state of South Dakota is Black Elk Peak, which is a mountain located in Pennington County in the Black Hills National Forest at an elevation of 7,244 feet (2,208 m). Black Elk Peak is located just a few miles to the west of Mount Rushmore. The lowest point in all of South Dakota is Big Stone Lake, which stretches across the border into Minnesota and has an elevation of just 968 feet (295 m). The mean elevation in the state of South Dakota is 2,200 feet (670 m) and there's a difference of 6,276 feet (1,913 m) between the state's highest and lowest elevations. The highest incorporated town or city in South Dakota is Custer, which is located in Custer County at an elevation of 5,315 feet (1,620 m). The town of Lead in Lawrence County is also very high at an average of 5,213 feet (1,589 m), with many parts of Lead being at higher elevations than Custer. Major cities in South Dakota include Sioux Falls, which has an elevation of 1,470 feet (448 m), Rapid City, which has an elevation of 3,202 feet (976 m), and Aberdeen, which has an elevation of 1,302 feet (397 m). Weather conditions at Mount Rushmore follow a humid continental climate with warm summers and cold, snowy winters. The summers can see average highs above 78°F (25°C) and a lot of rainfall, as well as thunderstorms. The winters at Mount Rushmore feature a lot of heavy snowfall, with over 50 inches falling annually at the national memorial. 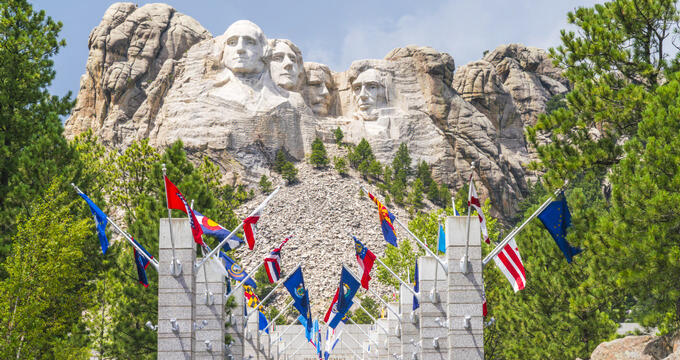 In spite of the cold weather conditions for long parts of the year, Mount Rushmore is the top tourist attraction in all of South Dakota, attracting several million visitors per year, both from the United States and abroad. On any given day, huge crowds of tourists can be seen snapping photos of the sculptures, and various scenic trails and hikes can also be enjoyed in the surrounding area.